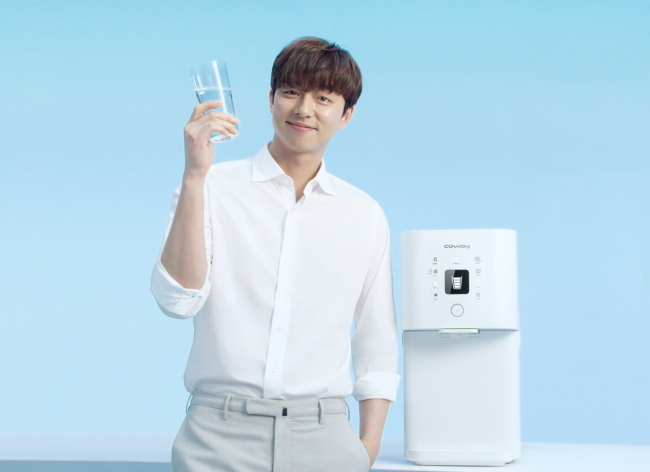 South Korean company Coway introduced the CIROO (Coway Intensive Reserve Osmosis) direct water purifier on June 18, moving to change the concept of water purifiers. The new product aims to resolve consumers’ dilemma of choosing between functions of a filter and a direct water purification system, the company explained. Originally, reserve osmosis membrane filters have less purified water capacity per length of use due to the dense and detailed nature of the filtering function compared to hollow fiber membrane or nano filters. But the CIROO direct water purifier has achieved a direct purification system by breaking the stereotype that a purifier equipped with the reverse osmosis membrane needs water tanks. The CIROO 2.0 filter is an improved version of the previous CIROO filters. It adopts the direct purification structure, using patented filters jointly developed with organic synthetic chemistry firm Toray. The filter uses “intensive active dense layer” materials that can remove ion substances that are ten-thousandth the size of a hair. It has expanded the filtering space by six times and increased the purifying capacity by 30 times. With the CIROO direct water purifier, the remnants in the flow path are all discharged and the water delivered is fresh. The CIROO direct water purifier also caters to the needs of consumers who care about sanitation. With the “transparent removable faucet,” consumers can check the abstraction area with their own eyes. Coway also provides a special care service that changes the flow path and faucet, free of charge. Consumers have the option to use three-stage personalized heated water at 45 degrees Celsius, 70 C and 85 C, and extract 120-milliliter, 250-milliliter and 500-milliliter amounts of water.